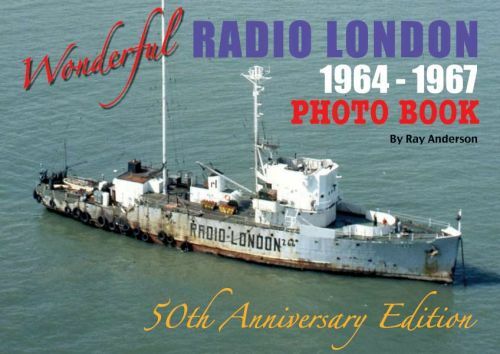 The Wonderful Radio London Photo Book is a superb ‘5oth Anniversary Edition’ souvenir account of the story of Wonderful Radio London, broadcasting from the MV Galaxy off the coast of Frinton-on-Sea in Essex. This book follows the station through her halcyon days during the 1960s. In this A4 Landscape size, 84 page photo book it tells the story of the station using a fabulous selection of black & white and colour photographs printed on high quality gloss paper. In fact, many have never been seen before - together with items of original Radio London memorabilia. They include undiscovered photographs of Kenny Everett, Tony Windsor and many other on-air DJs. This photo book follows the complete story of the radio station established on a rusty second world war minesweeper. Our photos show the initial fitting out of the ship in Miami Florida. The book is lavishly illustrated with over 170 photographs and memorabilia. Many have been rescanned from the original negatives and transparencies using a high resolution scanner and digitally restored to bring out every detail. Also included are photographs of many of the leading groups and pop stars of the day who visited the station. Plus a full DJ list of Big L’s thirty DJs. This photo book is a must for any Radio London fan and covers the story right up until the station closed down on Monday the 14th August 1967. Ray Anderson has painstakingly researched and produced this photo book which is the third book in a new series celebrating ‘The Golden Age of Radio’ to celebrate the 50th anniversary of these great stations.